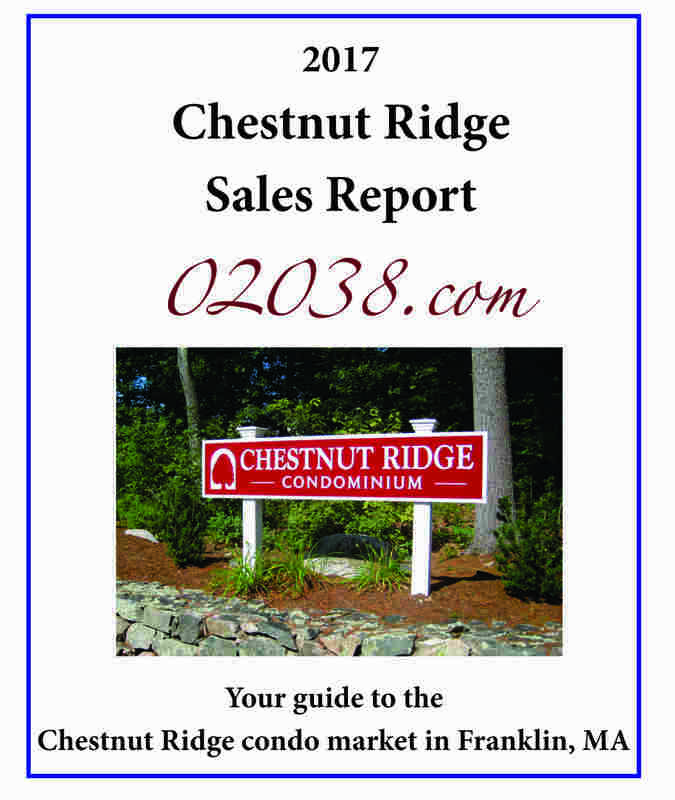 Sale prices at the Chestnut Ridge Condominiums in Franklin, MA rose nicely in 2017. The average sale price at Chestnut Ridge advanced to $410,000, a 16.5% gain over the average price in 2016. This is more than double the average sale price back in 2010 during the worst of the Great Recession! You would be wise to view this doubling with a grain of salt, however. 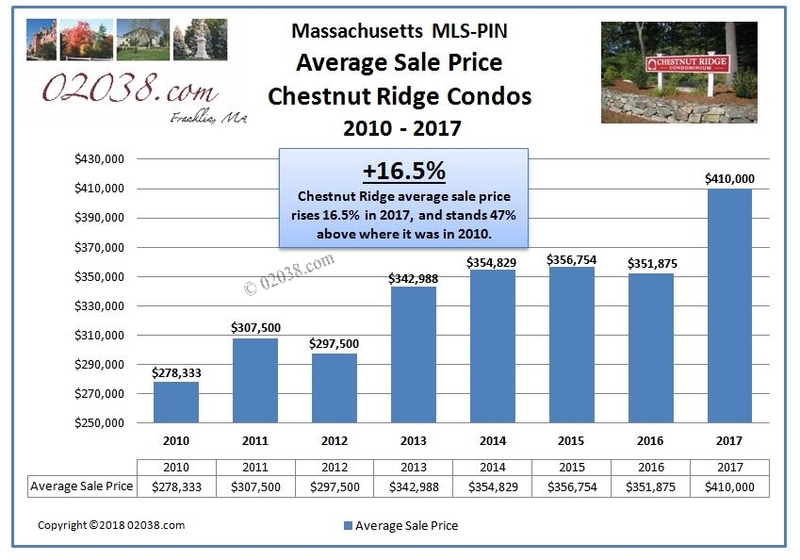 Because of the mix of units that sold at Chestnut Ridge in 2017, the year’s average sale price statistic does tend to overstate the rate of price increases at Chestnut Ridge. As we’ll see below, some very expensive freestanding units sold in Chestnut Ridge during 2017; these sales did help inflate Chestnut Ridge’s average sale price statistic for the year. The pace of sales at Chestnut Ridge slowed some in 2017, the second year of a mildly downward trend that started the previous year. Six Chestnut Ridge units changed hands in 2017, off two from the 8 units that sold in 2016. 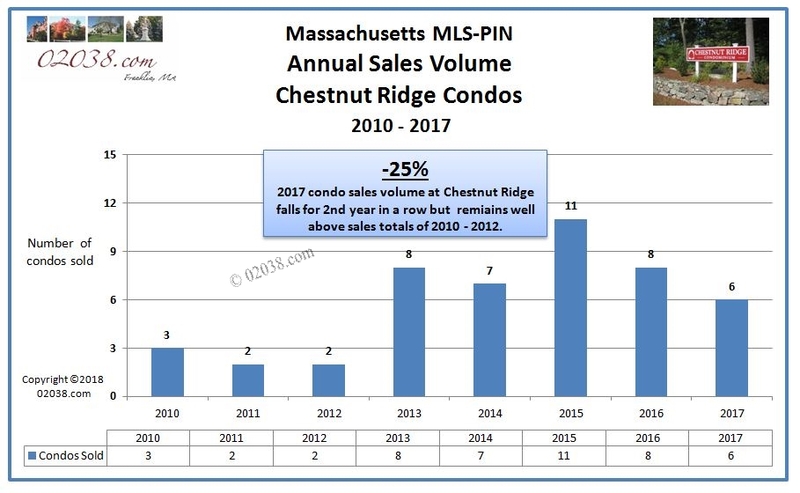 Six sales may seem small, but 2017’s sales total at Chestnut Ridge greatly exceeds the extremely low number of sales posted annually at Chestnut Ridge during the Great Recession back in 2010 – 2012. However, a more informative way to view the 2017 market for townhomes at Chestnut Ridge is to look at the sales by association. 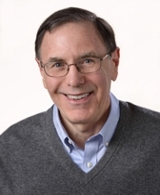 There are two associations at Chestnut Ridge: Chestnut Ridge I and Chestnut Ridge II. Sales reports for each association follow below. Two townhomes sold at Chestnut Ridge I in 2017, for $325,000 and $328,000, respectively. Each of these townhomes were end units. Each had two bedrooms, 2.5 baths and one car attached garages. Each unit had the kitchens originally installed with these homes. The sales of both units coincided with the announcement of a special assessment (affecting only Chestnut Ridge I) with did affect the prices at which the units eventually sold. Four townhomes sold at Chestnut Ridge II in 2017. All four offered three bedrooms, with first floor master suites. This extra bedroom on the first floor, compared to the two bedroom floor plans that predominate at Chestnut Ridge I, contributes greatly to the higher prices generally paid for homes at Chestnut Ridge II over units at Chestnut Ridge I. Note in the Chestnut Ridge II sales report the very high prices obtained for the two freestanding units that do not share any structural elements with other townhomes. One sold for $500,000 while the other sold for $536,000. These units sold at a large premium over the typical home at Chestnut Ridge II because they function like single family homes and afford valuable privacy. Each of these townhomes had two car attached garages. You can learn more about living at Chestnut Ridge in Franklin, MA here.